[[underline]]BOOKS[[end underline]] This is just a short notice to let you know that reviews will be finished next edition. [[underline]]BLESS ME, ULTIMA[[end underline]] Rodolfo A. Anaya This book is without a doubt one of the best Chicano books, written by a Chicano. Rodolfo has done a great job in bringing together the forces that the Chicano soul has long concealed. No wonder this book received the Quinto Sol award. You can get it at: Quinto Sol Publications P.O. Box 9275 Berkeley, California 94709 [[underline]]OCCUPIED AMERICA[[end underline]] Rudolfo Acuna We are in the process of taking a longer and more critical review of this book. 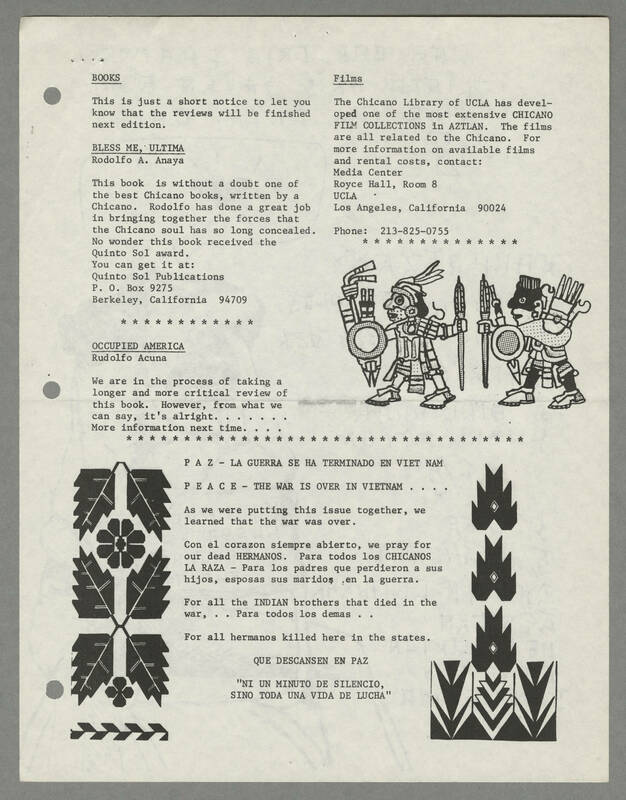 However, from what we can say, it's alright....... More information next time.... [[underline]]Films[[end underline]] The Chicano Library of UCLA has developed one of the most extensive CHICANO FILM COLLECTIONS in AZTLAN. The films are all related to the Chicano. For more information on available films and rental costs, contact: Media Center Royce Hall, Room 8 UCLA Los Angeles, California 90024 Phone: 213-825-0755 P A Z - LA GUERRA SE HA TERMINADO EN VIET NAM P E A C E - THE WAR IS OVER IN VIETNAM.... As we were putting this issue together, we learned that the war was over. Con el corazon siempre abierto, we pray for our dead HERMANOS. para todos los CHICANOS LA RAZA - Para los padres que perdieron a sus hijos, esposas sus maridos en la guerra. For all the INDIAN brothers that died in the war,.. Para todos los demas.. For all hermanos killed here in the states. QUE DESCANSEN EN PAZ "NI UN MINUTO DE SILENCIO, SINO TODA UNA VIDA DE LUCHA"